Back in the 1980s, the Denver Nuggets arguably had some of the most unique uniforms in the NBA. This was due to the fact that their uniforms prominently displayed a rainbow stripe across the center of the jersey and on the shorts as well. While NBA uniforms in the 1980s were very colorful for the most part, the Nuggets were the most colorful team of them all. Even their primary logo from back then was a happy display of the rainbow. As far as Denver's present-day look is concerned, things have gone from being vibrant and exciting to being a bit bland and dull. The Nuggets have gone back to being a mostly navy blue team and they are far removed from even the unique days of being a powder blue team, much less of a team that could claim the entire rainbow as their official team colors. On most nights, the Nuggets will not exactly have an exciting look on the court from a uniform standpoint. There is a saving grace, though. For what should be seven glorious nights, the Nuggets will reach back into their past to bring back an idea that served them well during the 1980s. 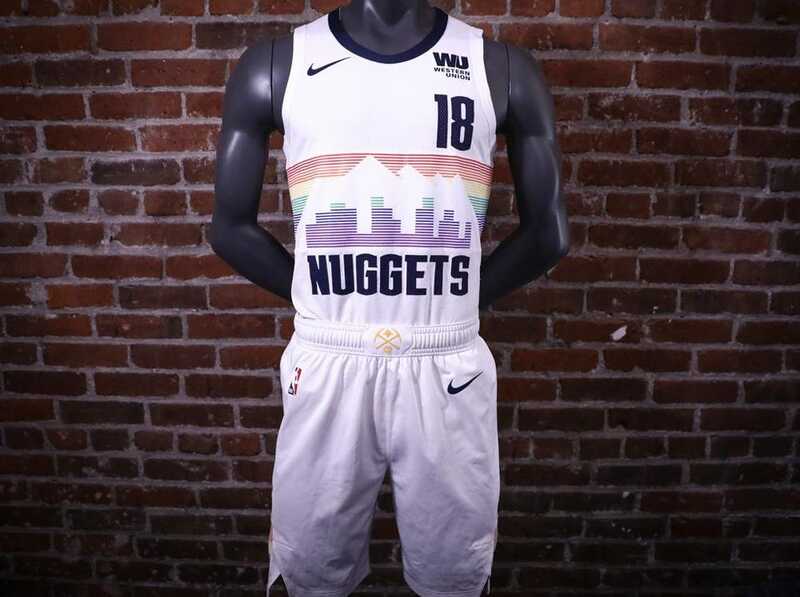 That's because the Nuggets and Nike have brought back the rainbow look for their City edition uniforms for the 2018-19 season. The design itself is a fantastic update of a classic look. 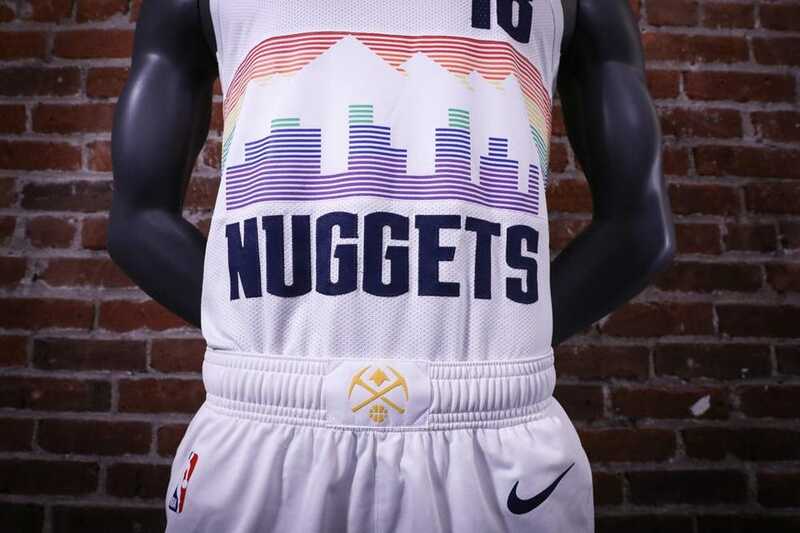 Rather than simply bringing over the old look and either wearing it as a Classic edition throwback uniform or updating it with the current colors, the Nuggets decided to bring back the rainbow and modernize the concept in the process. So I'd imagine that this would be the team's primary look had the team stuck with the rainbow identity throughout the past couple of decades as well. There are some slight changes when it comes to the rainbow and the skyline that is in front of the rainbow as well. For starters, instead of just being block lines of color, the rainbow is comprised of single lines of color. It's something that looks good up close and also has an impressive look from a distance as well. The other difference is that the skyline is slightly different as well. No skyline is going to remain the same over the years and Denver's skyline is no different. Everything changes and even the skyline on the uniforms sees a tiny bit of change as well. That type of attention to detail should be appreciated, as it's another little interesting element in this uniform. There will be plenty more City edition uniforms to be unveiled this season, but it's safe to say that this will be one of the best of the bunch in the NBA this season. The rainbow has returned to Denver and it hasn't come a moment too soon, either.